The Boone Library is housed in a 100 year old L & N freight depot that was moved from the Woodlawn area of Birmingham, Alabama to the museum. 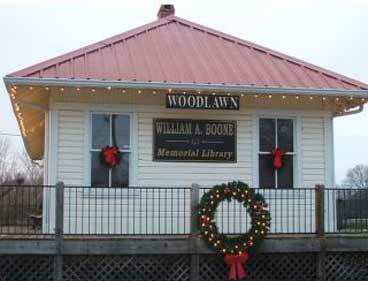 It is named after long time member and benefactor, the late William (Bill) Boone. The Woodlawn Depot building houses most of the library’s holdings. These include over 1400 books; 1100 DVDs/Videos/CDs; rail-fan periodicals, some dating back to the 1930s; employee magazines—e.g. Ties, L & N Magazine, etc; industry publications—e.g. Railway Age dating back to 1910; reference books, atlases and encyclopedias; maps, track diagrams, and equipment blueprints; passenger and employee timetables; photos and slides; and, other memorabilia. One of the museum's former U.S. Air Force Guard cars attached to the Woodlawn building holds a large assortment of technical manuals, rule books, ICC reports and other rail-related print materials dating to the early 1900s. The library also houses a collection of children’s rail books both fiction and non-fiction. steam locomotives dating from the 1920s to the 1960s. items held by the library. The Boone Library is open Saturdays from 10AM to 4PM and by appointment on other days. For appointments call the Heart of Dixie Railroad Museum'soffice at 205-668-3435.